The introduction of the processor instructions AES-NI and VPCLMULQDQ, that are designed for speeding up encryption, and their continual performance improvements through processor generations, has significantly reduced the costs of encryption overheads. More and more applications and platforms encrypt all of their data and traffic. 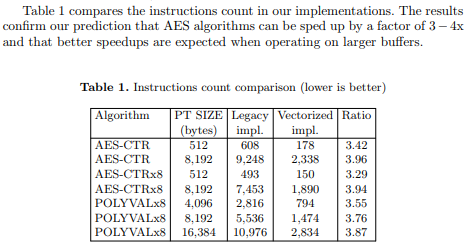 As an example, we note the world wide proliferation of the use of AES-GCM, with performance dropping down to 0.64 cycles per byte (from ~23 before the instructions), on the latest Intel processors. This entry was posted in Computer, Hardware, Library, Murmuring, Network, Privacy, Security, Service, Software and tagged aes, cpu, cycle, gcm, ice, instruction, intel, lake, ni, vectorized on May 2, 2018 by Gea-Suan Lin.